Scissors chair. MEDIEVAL MARKET - SPES. 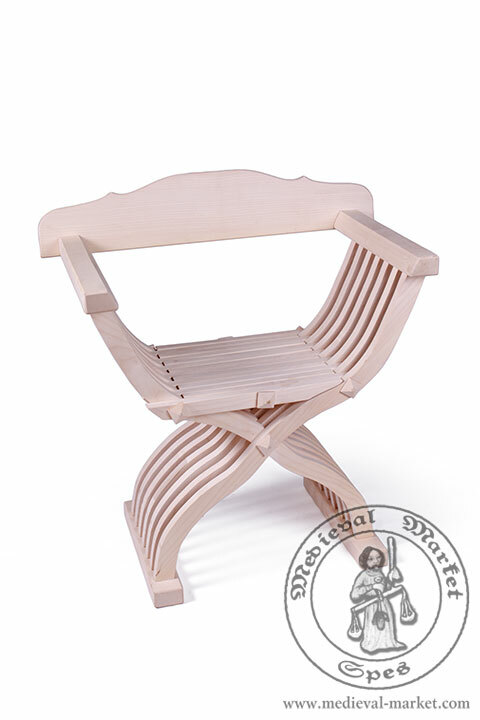 A scissors chair is a type of askew linear medieval chair. This wooden chair is made of high quality oak or pine. Its well-thought construction makes it both convenient and stable. This type of medieval furnishing consists a range of laths connected with a ridgepole in the middle part. 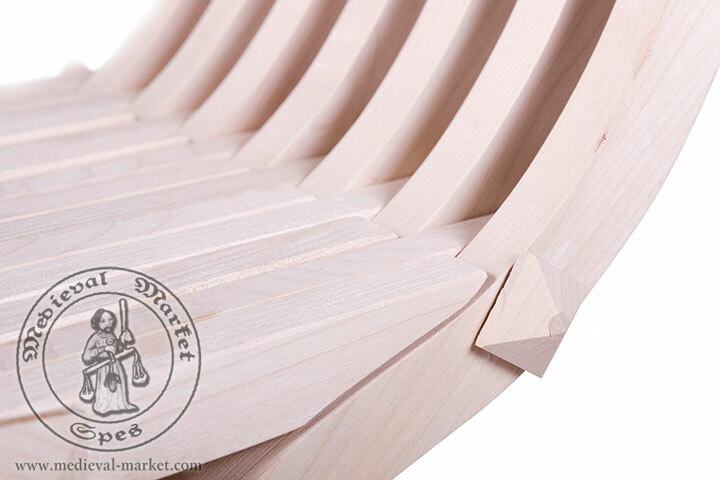 The laths spread out by turns and make armrests, seat, and legs of this historical chair. What is more, it has a removable backrest. 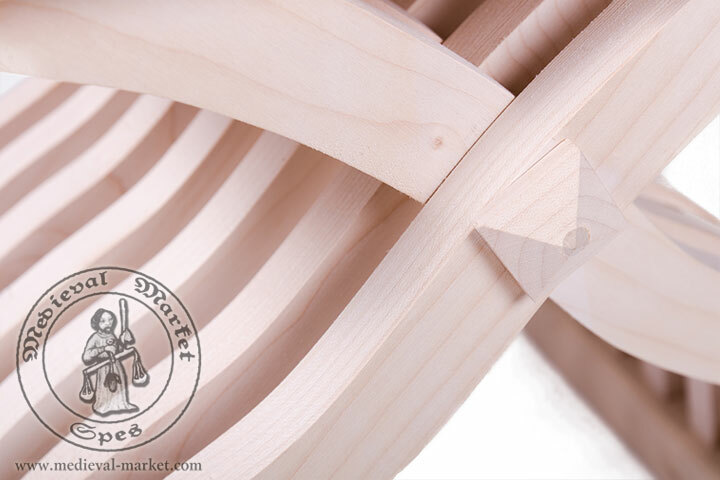 Our scissors chair in standard is made of oak or pine wood. On special request, we can make it from a different kind of wood. Its name derives from a characteristic move made by this medieval chair. While being folded and unfolded, it makes a scissors move. 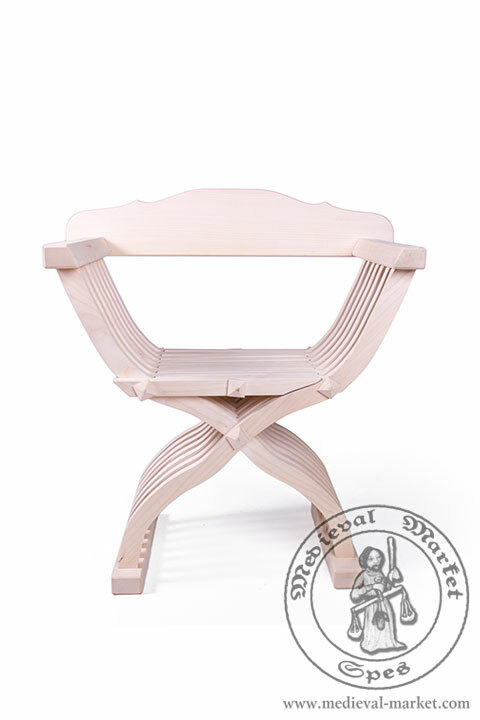 Medieval scissors chair derives from a curule chair and an X chair, also available in our shop. Mentioned wooden chairs were given a backrest, often richly encrusted. Another step in the history of chair was replacing the removable backrest with a permanent. From this moment a historical chair was no longer foldable. Despite the fact that medieval furnishings were used as house equipment, we can also find them in knights' camps. These items were an evidence of high social status and wealthiness of the owner. Among camp equipment we can also find: buckets, baskets, pots, tables and stools, historical chairs, chests, and beds. Early Gothic furniture was usually made of heavy wooden planks. The biggest group of original furnishings saved till this day are chests, often characterized by rich adornments. They often have visible emblems and embroideries.